With five children, three of them being teen aged boys, you can imagine the amount of pizza that we go through in this house. Often homemade pizza and easy pizza crust is my go-to meal when I serve large groups (especially with kids), but when I am in a rush and want the yummy comfort food taste of pizza without the hassle, this Pizza Casserole recipe, made with biscuits, pleases everyone. The amounts that I have listed are very general. If I have a group of teens walk through the door wanting food immediately, double this recipe, since it disappears quickly. Have fun and get creative with this easy pizza casserole recipe. Make it your own. I often get store bought biscuits nearly free with coupons, so this is one of those inexpensive meals as well. Once, in lieu of biscuits, I used store bought pizza crust (also nearly free with coupons), and cut it into strips and layered it across the top. This recipe is so easy and forgiving, you can’t mess it up. 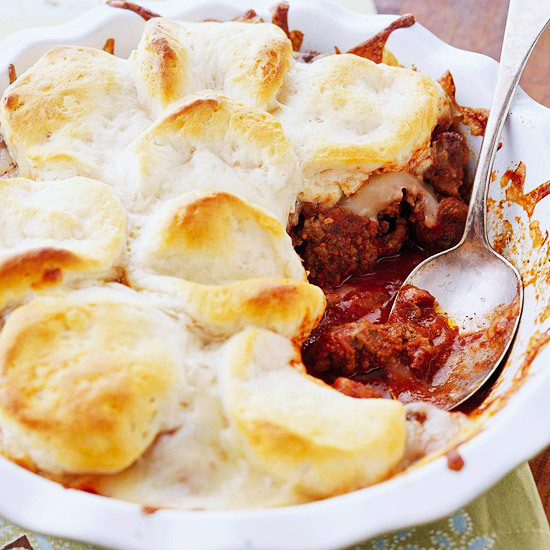 It’s a perfect casserole to teach to your children on those “Cooking with Kids” Days. Since I typically cook up my ground beef in bulk, and have it already made, this recipe will come together in approximately five minutes of prep time, which definitely meets my requirement for a “Ten Minute Dinners” recipe. Summary: In just a few minutes of preparation time, you can serve up all the flavorful taste of your favorite pizza in a comfort food casserole. (optional ingredients for “toppings” – pepperoni, sausage, onions, black olives, green peppers, mushrooms, anything else that you desire for added toppings. If you do not have pre-cooked ground beef already prepared, then cook the ground beef in a large skillet until no longer pink, stirring frequently. Drain off fat. Stir in your choice of sauce; heat through. Transfer mixture to a 2-quart rectangular baking dish. Add all of your optional ingredients. Flatten each biscuit with your hands; arrange the biscuits on top of the cheese. If they are larger sized biscuits, break them up into smaller pieces. Bake in the preheated oven approximately 15 minutes or until biscuits are golden. Have fun and get creative with this. If you like more sauce, then use a full can of spaghetti sauce (I always do). I make something very similar all the same ingredients. …I just take the biscuits and press them into a muffin tin and then add the toppings and top with cheese. You can eat them right out of the oven or let them cool and freeze them for on the go snacks. I’ve done them with a taco theme too and that’s really yummy as well. This sounds delicious!! I think I may try it with ground Italian sausage instead of the ground beef. That’s what I have on hand at the moment.